We’ve been incredibly busy putting our house back together after Christmas! I always like to try and start the new year with everything organized and in its proper home. That has meant a ton of trips to Target and other stores for some supplies. We’ve also been working on our Master Bedroom (finally!) so I thought I would share with you the semi-official plan for the space. We finally picked a bed and chose the Valencia Sleigh Bed and matching bedside tables. 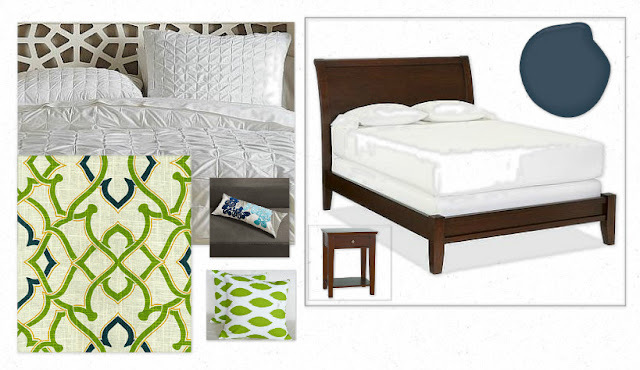 We’re going to paint the rooms Hale Navy by Benjamin Moore so we wanted to keep the bedding light and airy. The pintucked bedding from West Elm really fits the bill for that. Our drapes will be made from the P Kaufman Linked fabric. Add some throw pillows and we’re pretty much done. All we need are some lamps and those are still in the selection process. So, where are we with this plan? The bed is in and set up in our room. We’ll pick up the bedside tables this week because they finally made it into the store. I’ve had the bedding for awhile but am keeping it in the closet until all the painting it done. As for painting…the sample is painted on the wall and we are aiming for actually doing some painting this coming weekend! YAY! Anyone have any lamp suggestions? I’d love to see them. Looks great so far. I love the combo of dark wood and the colors you’ve chosen. That shade of green is awesome! We’re in the middle of re-doing our Master too. I’ve just had to nix our first bedding choice this week, and I love what you have chosen…off to West Elm to check it out :-). Visiting from The French Country Cottage. That pin-tucked quilt is divine! Can’t wait to see the finished product! Absolutely LOVE that bedding! I need to get my Master redone! I am waiting until I can upgrade to a king size bed before really doing it though!